A delegation of nine group members attended this years MRS Fall Meeting in Boston. 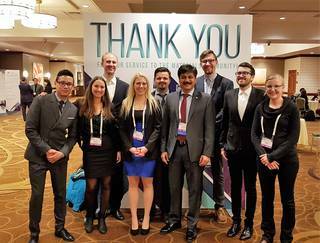 The delegation, consisting of Markus Schütz, David Graf, Daniel Stadler, Alexander Möllmann, Jennifer Leduc, Isabel Gessner, Valeria Weißbrot, Dr. Ashish Lepcha and Dr. Lisa Czympiel accompanied this years' meeting chair Prof. S. Mathur to Boston. All in all, the group participated with four talks, 14 posters and four contributions to the `Science as Art` competition. Additionally, Jennifer Leduc and Isabel Gessner, as President and Vice-President of the MRS University Chapter in Cologne (for more information check: http://mrs.uni-koeln.de), very successfully organized a Summit on 'Sustainability and Nanotechnology` together with other University Chapter ( http://www.mrs.org/university-chapters) representatives. Congratulations to this wonderful event!